The first organ was a "unit" organ, which was situated on the Gospel side, approximately where the present console is now located. It is believed to have come from a church in Ansonia. It can be seen in an early photo of the interior of the church. That organ was replaced by a Hall Organ of (maybe) 9 ranks sometime about 1909. This date was determined using a photo taken of the church at that time which shows the organ trancept. The console was against the pipes and the action was electro-pheumatic. Hall Organ Compay was located in New Haven, and the Hall organ was dedicated to the memory of the Rev. Peter Shepherd, a former rector of Holy Advent. To celebrate Holy Advent's Diamond Jubilee (75th Anniversary), the organ was re-leathered and re-felted as mice and time had caused significant damage. The cost for the repair was $1500. A re-dedicatory recital was played by the organist of Trinity College, Clarence Watters. There was also a jubilee service held and there is a picture of the participants which was taken on the Church's front steps (see below). A commemorative booklet hung on the wall of the church at the time. 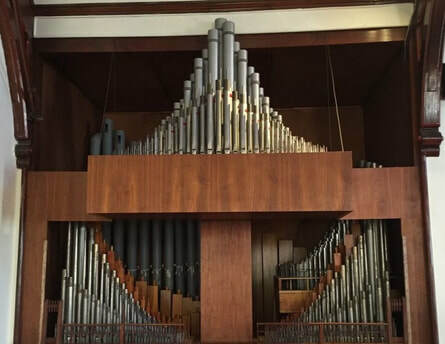 The Hall organ was not very satisfactory, and Father Overton Sacksteder III obtained an anonymous igft of $7500 toward a new one. The Music Committee received the name of John Waggoner of Storrs, CT. John had been with Holtkamp Organ Company in Cleveland, OH and had built several small organs in CT. The Music Committee traveled to various churches to hear his instruments. Due to Mr. Waggoner's health issues, a performance contract could not be obtained, but the Music Committee decided faith was a good reason to select him. Additional funds were raised and in 1963 (or 4), a contract was signed with Mr. Waggoner to build a new organ. After the Hall organ was removed, the Methodist Church loaned us a small electric organ. The installation of the Waggoner organ began in the late summer of 1964, shortly after Mr. Waggoner passed. Father Sacksteder made arrangements with Richard Geddes of Winsted, CT to install the instrument. Charles Stannard, Chairman of the Music Committee, put out a request for funds for the installation. One magnificent woman gave Holy Advent the balance of funds needed and the instrument was installed. There was a question regarding how to place the chest and pipes for the Oberwerk (manual). In consultation with the carpenter, Mr. Stannard designed the placement of the pipes. On All Saint's Day 1964, at a service for Rev. Arthur B. Robertshaw III's installation, Bishop Walter H. Gray dedicated the instrument. In or around 2005, the original console was replaced with a 10-year old Austin console so that the number of ranks could be increased. An 8' Principal was added to the now called Great and coupled on the pedal. The bottom 12 pipes were "upscaled", increasing their volume and thus adding to the foundation, and a flute stop was added to the Great for choir accompaniment. The Gedakt was moved from the Great and placed in the new chest with the 8' Principal and made playable from either the Great or the Oberwerk. The 8' flute (Bourdon) was placed in the chest where the Gedakt was formerly located. At that time, plans were made for a cornet and tabs were plaed on the Oberwek for the Tierce and Nazard which would give a reed sound. All of these changes were made by Alan McNeely of the McNeely Organ Company of Waterford, CT who also maintains the organ to this day.